Brooklyn Friends School | Lower School Art Teacher, Susan Greenstein Explores Landscape in her Recent Art Exhibition. Lower School Art Teacher, Susan Greenstein Explores Landscape in her Recent Art Exhibition. BFS Lower School Art Teacher, Susan Greenstein is an artist who in endlessly inspired by the world around her. When not in her BFS classroom, she can most likely be found painting alongside her husband, fellow artist and art teacher at Edward R. Murrow High School, Phil DeSantis. Greenstein and DeSantis have been painting together for over 25 years. 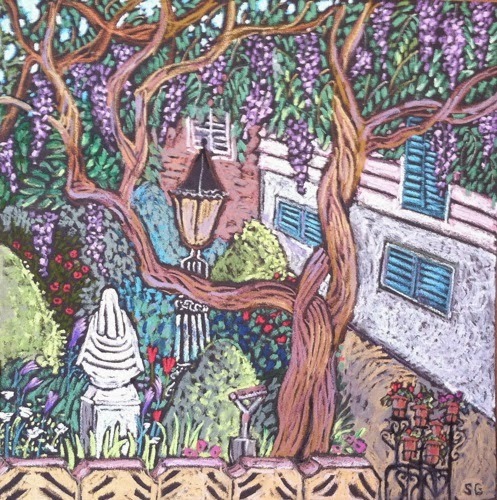 Whether they are capturing the view from a rooftop building in Siena, sketching Dutch style architecture in Red Hook or setting their painting easels down in the middle of a New England dairy farm, Greenstein and DeSantis continually draw their own distinctive inspiration from the unique character of a place. In September, 2013, Greenstein and DeSantis presented their recent work in a two-person show at the Park Slope art space, 440 Gallery. This show, titled Paesaggio, explored each of their journeys as landscape painters. The juxtaposition of these artists’ works presented their shared passion for capturing the tapestries of color, light and texture that can be displayed just as lusciously within the shadows cast on the bricks of a Brooklyn building, as it can in the fall foliage. Although their subject matter often overlapped, DeSantis’ works are rendered in layers of jewel-like watercolor washes with an emphasis on describing landscape and architecture through the light and shadow. DeSantis has a particular fascination with industrial structures, and says that he is “attempting to preserve them through his paintings as they continue to disappear from our landscape”. Greenstein’s approach tends to focus more on color and texture, using rich oil pastels on a dark ground to create a distinctive vibrancy to her pieces. As an additional treat in the exhibition, visitors could view a large collection of Greenstein’s sketchbooks. Filled with intricate line drawings, these little artists’ books not only provided an intimate window into her process, but revealed a different relationship to these spacial investigations. Greenstein’s sketchbook drawings lovingly obsess over details found in the edifices of buildings, typography scrawled on coffee shop walls and the patterns found in old tin ceilings. Rendered in elegant yet quirky contour line and rich, varied hatch-marks, these little pen drawings were a bonus exhibition unto themselves! If you were not lucky enough to see this fabulous exhibition while it was up, here is a sampling of the work that was on display. And of course, if you happen to be on the third floor of the Pearl Street building, stop-on-by an say hello to one of our favorite the artists from this show!